Save time, money and energy by allowing WK Stock Manager for PrestaShop to do the work for you! In addition to its intuitive and simple interface, WK Stock Manager for PrestaShop allows your online store stand out from others! Working hour, save the day! WK Stock Manager is the personal assistant of your dreams, which practically makes everyday tasks, saving you an incredible time. With this module, manage several shops! 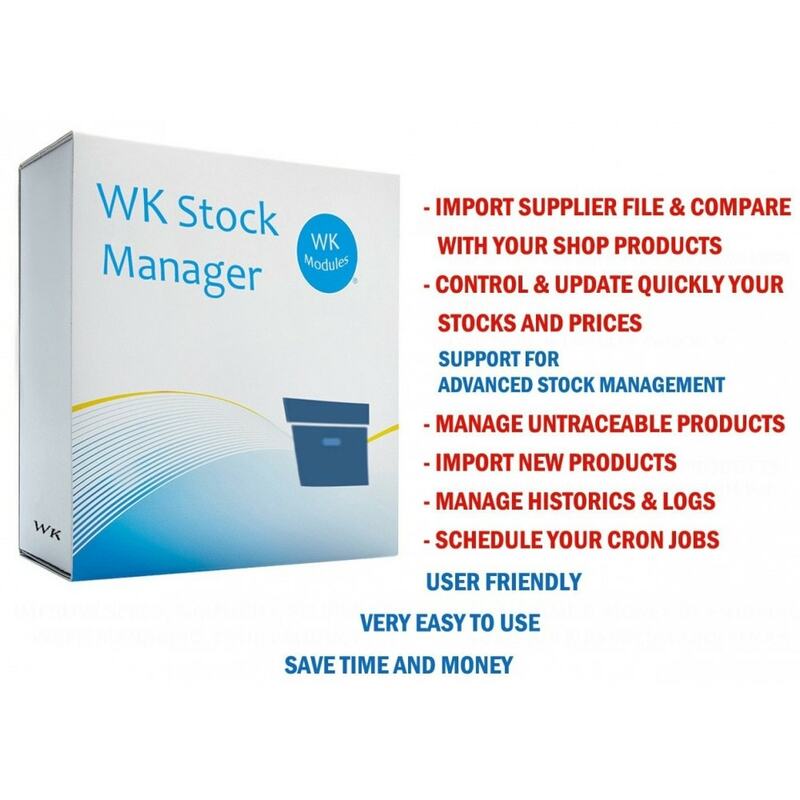 WK Stock Manager allows you to manage your store easily ... and at unbeatable prices! Ability to create unlimited cron jobs and schedule their executions in order to import automatically products from suppliers files => help you saving you an incredible time ! Ability to run the CRON tasks manually => Import all your supplier files with a single click! Ability to impact automatically the differences found in wholesale prices to retail prices in the comparison boards (if your gap prices are based on wholesale prices gap). Ability to adjust and override quantities and retail prices directly in the list for each product found if needed (instant update), no need to return after to edit each product one by one and change it manually from backoffice product. Ability to compare product details informations with those found in the supplier file before lunching update. You can choose to automatically activate products that will be replenished before the update. You can also choose if you want to apply the update of the following informations: Reference, EAN13, weight, name, description (long ans short), warehouse and images to your shop products. Ability to remove stock (reset) for products/combinations (Causes: unavailable stock, product withdrawn from the market, etc.). Ability to disable or delete selected products/combinations. Import stocks, wholesale prices, References, EAN13 codes, weight, names, descriptions, warehouses and images for each product. You can define a manufacturer (brand) and categories for the new products you want to insert into database. You can also save them activated or deactivated. Paging system for generated boards lists. Help, shortcuts, tooltips and notifications to help you using our module. Import module supports large and big files (tested with a file whose capacity 35Mo and containing at least 16,000 lines). Help optimize occasionally historics table (by truncating table or cleaning orphan lines). Do not hesitate to contact us if you have any questions or problem with our module. We respond very quickly. In order to improve constantly our module, we are always attentive to your suggestions or your customizations. Add ability to replace found quantities instead of updating them. Improve codes functions & Add PHP 7.2 compatibility.